The Tedesco Agency’s ongoing community enrichment program initiates a new charity campaign in support of the many life-enhancing programs offered to the area’s youth by Boys & Girls Clubs of Greater Dallas. We believe there can be no worthier mission than to prepare our children to be contributing members of society. After all, they are the future of our community. It’s up to us to care enough to prepare them well. The Tedesco Agency celebrates the beginning of the latest charity campaign in their ongoing community involvement program, which serves families of Plano and northeast Dallas. 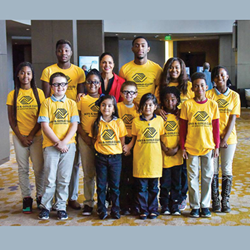 A new fundraiser for Boys & Girls Clubs of Greater Dallas has been initiated to support their many life-enhancing programs for the area’s children and adolescents. Contributions are now being accepted at: https://bgcdallas.org/donate/. Boys & Girls Clubs of Greater Dallas began operations in 1965 with a mission to enable all young people to reach their full potential as productive, caring, responsible citizens. Devoted to providing a safe place for children and adolescents to learn and grow through ongoing relationships with caring adults and life-enhancing programs, they provide hope and opportunity to thousands of boys and girls from low-income neighborhoods. It is an organization which stands for traditional values, while providing progressive programs addressing the problems faced by kids today, including substance abuse, teen pregnancy, gangs and violence. Determined to save children from lives of crime and failure, services include the arts, education, leadership and character building, sports, recreation and life skills. The Tedesco Agency’s hard-working team is busy rallying support for Boys & Girls Clubs of Greater Dallas. The agency’s network of professional partners, customers and personal contacts are being invited to actively participate not only contributing financially, but also by helping to spread the word to others in their own circles of influence. Additionally, the campaign has been featured in the agency’s monthly magazine, which is delivered to thousands of households in the greater Plano and Dallas areas. The electronic flipbook version of the current issue of Our Hometown may be viewed here: http://www.thetedescoagency.com/Our-Hometown-Magazine_39. The Tedesco Agency will acknowledge all those who donate a minimum of $5 in a future issue of Our Hometown. And it’s never been easier to give, as the agency has pledged to donate $10 to the campaign for each and every referral they receive for an insurance quote, with no purchase necessary. Readers may view the campaign, refer a friend and/or make a personal donation here: http://www.thetedescoagency.com/Creating-a-Brighter-Future-for-Our-Youth-with-The-Boys--Girls-Club_23_community_cause. The caring team at The Tedesco Agency has promised to unveil a new campaign every two months. Concerned members of the community may also submit ideas for future initiatives here: http://www.thetedescoagency.com/Add-Community-Cause_53. Ideas chosen will be contacted by a representative of the agency’s Community Program. Information on past causes supported by the agency may be found at: http://www.thetedescoagency.com/community-cause. To learn more about the agency and Boys & Girls Clubs of Greater Dallas, please visit http://www.thetedescoagency.com/ and https://bgcdallas.org/. Serving the families greater northeast Dallas from offices in Plano, The Tedesco Agency is a locally owned and operated, full service insurance provider whose mission is simple: to provide the finest insurance and financial services in the industry, while delivering consistently superior service. Jake Tedesco and his team of caring professionals focus on protecting all the things which are most important to their clients (their families, homes, cars and more), and in helping to prepare long-term strategies to enable financial success. The dedicated experts at The Tedesco Agency may be reached by calling 972-985-5515 or toll free 800-487-7728.